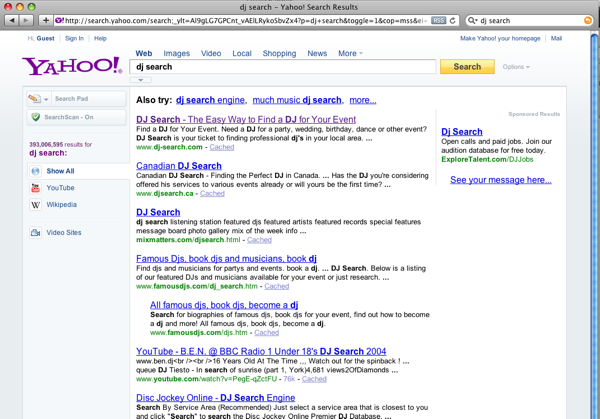 A couple weekends ago, I slammed out a new site, called dj search. 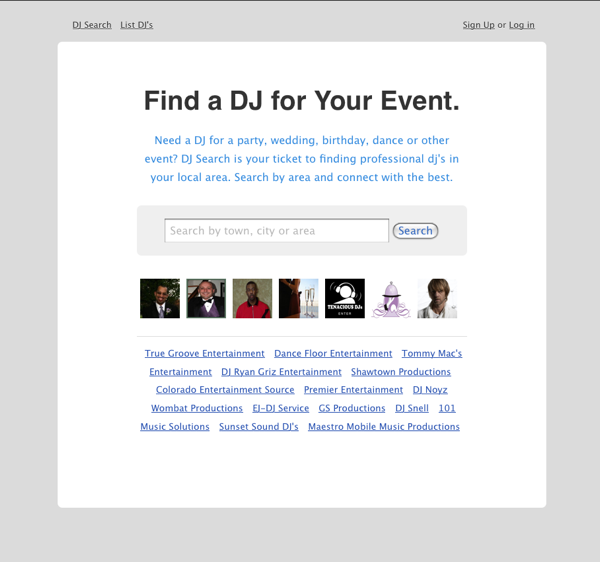 The concept behind the site is obvious: find a dj for your upcoming event. We wanted the design and functionality to be “as simple as simple can be”. Constructed with the help of a friend who is a professional dj, we cranked the site out in a weekend (plus a couple of part-time days of fine-tuning). The fact that we could design, code and deploy our app in less than 48 hours is testament to Rails’ power and efficiency. You know, Twitter-style URLs. Search engines love these slugs. How do I know? The answer is simple: In just a couple of weeks, we hit #1 on Yahoo for our primary search term and #6 on Google (1st page). Not a bad start. As you can see, nothing too complex or involved. The basics. I did, however also add some tasty jQuery effects on the main page – a horizontal slider which serves up avatars of users (dj’s). I also added a “dj cloud” on the main page which is randomly populated from the database. Check it out if you need a dj for your event. Your rails developer skills seems like you must be doing rails all night. I am a huge christian music fan and think you should be too.